Summer is one of the best times of year for drone enthusiasts. Clear skies, descent weather, and many new opportunities to get some great shots and overall air time. For those who haven’t thought about investing in a waterproof drone yet, we’re here to give you a bit of a push. While your selection of waterproof drones may be a small one right now, we’re hoping to see this list grow by next summer. Even during rain, snow, sleet, you name it, these drones can handle all of it. Waterproof drones with camera are a great addition to anyone’s collection. They’re perfect for getting the best shots during wet weather and underwater without the user having to worry about the electronic components being damaged. Their frames are sealed tight to ensure they can withstand something so extreme as sitting on the bottom of a pond! Make sure you the time to become a certified pilot before attempting to fly your new waterproof drone. You’re going to want to know how to fly if you’re spending thousands on a new waterproof drone. 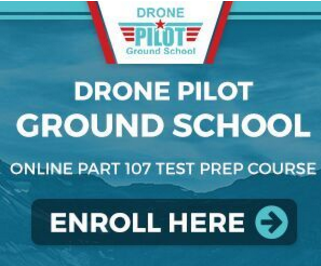 Check out the #1 rated drone pilto school and get $50 off the price of the course for being a dronethusiast reader. Click here to get your discount. We’ve tracked down all of the best waterproof drones currently for sale. Each one has something a little different to offer, but they are all waterproof models. Even though there are a number of waterproof drones out on the market today, the Splash 3 by Swellpro was the first modular, all-weather waterproof drone. It’s able to both land and float on fresh and salt water and has the ability to fly in any weather conditions. The amphibious UAV platform has a number of modules that can be switched out for various tasks. For example, you can change it to have a release mechanism for a fishing line, fishing bait, and even has the ability to drop equipment for emergencies if the need arises. The payload release device is sold separately, however. At this time of writing, the Splash 3 by Swellpro is currently priced around $1,700, and we no doubt see why it’s currently that expensive. Who said waterproof drones have to be insanely expensive? The Aqua RC by Braha sets the stage for waterproof drones that won’t drain your wallet. You can fly it both indoors and outside, it comes with a rechargeable battery that is built-in, and is an overall simple, yet very useful, quadcopter. 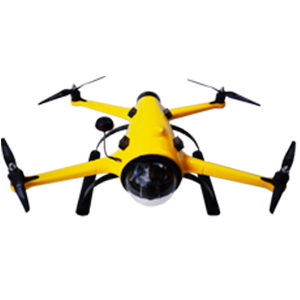 This is one of the best waterproof drones specifically for those who are trying to get one with that as its main feature. 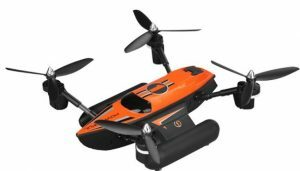 Therefore, if you’re looking for a simple drone that offers basic specs and features, but is a waterproof model at the same time, you’re going to love this one. At this time of writing, the Aqua H2O by Braha is priced around $32, which is a great price for what you’re getting. It’s a basic drone that runs well and is 100% waterproof. Parrot is a drone manufacturer that we all know and love. They boast quality, affordability, and never fail to please the masses. 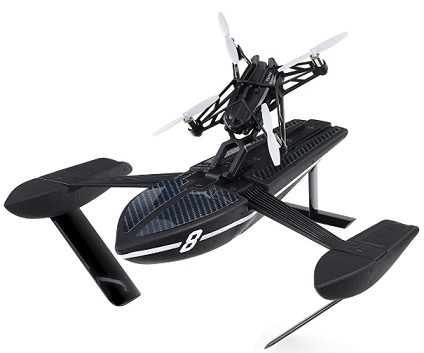 The Parrot Hydrofoil MiniDrone is definitely no exception to these qualities. Not only do you not have to worry about registering with the FAA, it’s both air and water-ready and built with a hydrodynamic hull and streamlined foils to ensure it can move effortlessly through the water. All you need to use to control the Parrot Hydrofoil MiniDrone is a smartphone or a tablet and the FreeFlight 3 application and you’re good to go! At this time of writing, the Parrot Hydrofoil MiniDrone costs a measly $38. The JJRC H31 by Goolsky has definitely won a place in our hearts. Not only does it have a cheap price tag, but it has the most bang for your buck compared to the previous two cheap waterproof drones. You can choose between green and white for the color, have Headless Mode at your disposal, multiple flight tricks, and so much more. One of the best features this drone has is the over-charged protection, which ensures that your battery is protected. It’s a great beginner drone because it doesn’t go all that fast if you have it on the lowest setting. There are multiple speed levels to ensure that it’s able to be used by all skill ranges. At this time of writing, the JJRC H31 by Goolsky is priced around $33, which is practically stealing. You’re getting some awesome unexpected specs and features, never mind the fact that the manufacturer packed all of this in plus the waterproof capability. The Q353 Triphibian by Goolsky is an awesome waterproof quadcopter that’s ready-to-fly right out of the box. It’s uniquely made with a design in mind that allows it to support Air, Ground, and Water modes. Even if it’s submerged or has flipped upside down in the water, it’ll roll itself right way up easily. It also comes with a flashing LED light that allows for better visibility in low light settings. This is especially useful for when the drone is submerged in water. You’ll be able to see where it is at all times. The orange color also helps with visibility when in the water, as well. This, paired with the flashing LED light, ensures that it’s going to be very difficult to lose it in the water. At this time of writing, the Q353 Triphibian by Goolsky is going for around $104, but trust us when we say it’s worth every penny. Even though it’s more expensive than the budget drones on our list, never mind the first one, it’s still considered a budget drone. The fact that it’ll flip itself when face-down in the water alone is a must-have. This one is geared toward enthusiasts who like to build their own stuff and make it their own, whether they switch out a couple of things to their liking or just like to build. The QuadH2O Kit comes with everything you need to get your specific build ready before you do any installations, but you will need a couple of components separately. For example, the remote control and LiPo battery, which will need to be supplied on your own. At this time of writing, the QuadH2O Kit runs for around $850. This price is only for the kit, however, so be prepared to be paying a lot more for the electronic components. What’s the difference between a waterproof drone and a water resistant drone? Waterproof drones are able to be fully submerged in bodies of water without the user having to worry about damage. Their electronic components are completely sealed off and cannot make direct contact with the water. Water resistant drones, however, are not sealed completely, so they can’t be submerged. They can handle mild snow or rain, but if they become submerged, they’ll be damaged. 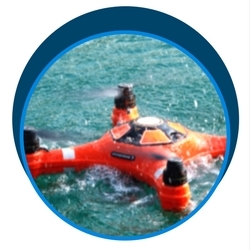 What are waterproof drones used for? You can use a waterproof drone for essentially anything. Whether it’s during heavy rain, other extreme weather conditions, to get some underwater shots, while you fish or kayak, you name it. What should I look for in a waterproof drone? Other than the drone actually being waterproof, you should be very careful when looking at the price. If it’s suspiciously cheap for a drone of this category, you may want to avoid it altogether. That, or look into it more seriously to find out that it’s only water resistant instead of waterproof as it was initially advertised. Waterproof drones are some of the best pieces of technology we have today. We can now take our electronics underwater, so there is no limit to the types of footage you can get when you have one of these.